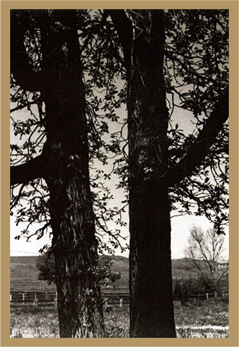 The farm was named in honor of Phoebe Ann Evans Steele (New York, 1835 – Boulder, 1908), a remarkable pioneer and one of the very first female homesteaders of the American West. Before embarking with her husband and their children on a hazardous journey across the Great Plains, Phoebe took two small saplings of her garden’s old oak, a tree she had been very attached to. After weeks of seemingly endless traveling in their oxen-driven wagon, the family finally arrived in Boulder on October 11, 1865. A few days later, her husband died of typhoid, leaving her stranded with two children and an infant to care for in a rough land. But Phoebe was determined to carry out her and her husband’s dream. 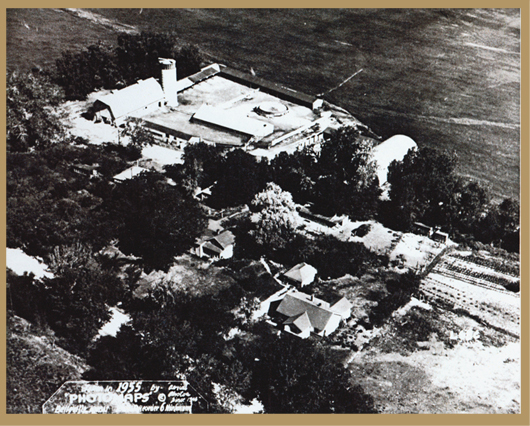 In 1869, after having successfully fended for herself, Phoebe bought a claim on a homestead East of Table Mountain and laid the foundation of a very prosperous farm. 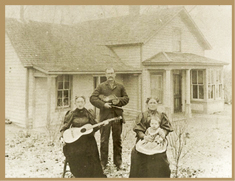 She also planted the two saplings of her Wisconsin oak tree, which grew to become magnificent oaks. Today, Twin Oaks Farm is a center for equine-facilitated psychotherapy and healing arts, as well as a riding and boarding facility. The farming tradition lives on: Twin Oaks Farm also produces a high-quality grass hay and alfalfa for its twelve equine residents, its llamas, and goats. Everett Steele, seated on the buckrake in this early 1900's photo. 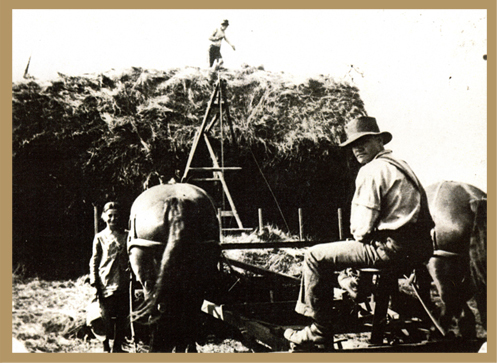 Hay and alfalfa are still produced for use and sale at the farm. 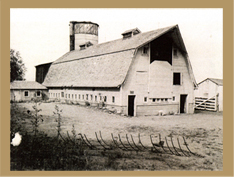 The dairy barn, built in 1925, photographed in 1949.